What are the strong points of a Disconnected handwriting? Of course, the descriptive memory as the mind, through a strict analytic work, facilitate the focusing of details. This is why it is not surprising that the books published by Kerouac are all strictly autobiographic. He was endowed with a prodigious memory (as a child his nickname was “Memory Babe”), that became his main writer’s instrument. His novels just tell about his life experience events changing only the characters’ names and the places where the narration unfold, in order to keep safe from lawsuits. Drug assumption was the fuel that allowed him to link together the facts filed in his mind to a narrative shape. All his numerous literary works had been written under drug’s effect, to the point that critics linked any novel’s emotional tune to the specific drug he was taking- to facilitate associative processes- at the time. (2) Benzedrine, hashish, marijuana, opium and streams of alcohol allowed him to solve his sense of inner fragmentation, segmented analysis and therefore of detachment from reality that prevented him from becoming passionately involved into life. 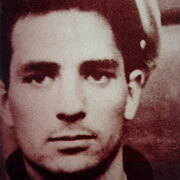 Kerouac evaluated such beneficial effect not according to artistic (that is, the arousing of powerful images) but to matter-of-fact, practical terms, typical of the sign Disconnected, characterized by being concrete: he counted how many words he could write under each drug dose’s effect. Some features of the sign Disconnected inform both his artistic personality and his feeling uncomfortable about taking part in daily life. Kerouac is basically a misfit in several life areas: he cannot belong to the bourgeois world, therefore cannot either keep a job position or a relationship working. More than that, he cannot easily nor fully belong to his own “alien” world. He chooses as main character in his most famous novel, “On the road”, not himself but his friend Neal Cassady, a real life-lover, endowed with the adventurer’s spirit and always ready to start over, to dash into a new enterprise, to try something new. On the contrary, Kerouac admits his worst pain is his lack of zest for life. When – at last – both mundane and financial success come, they get into his life like a bright spotlight, to point out all his life’s contradictions: at forty he is still living with his mother, who supported him till then; drug addiction had been replaced by alcohol addiction, so obsessively that both his body and personality came out devastated. Physically, he suffered from the horror of delirium tremens; psychologically, he became querulous, paranoid and socially an outcast tortured by feelings of persecution typical of alcoholics with time. He cannot trust anybody, least of all his friends. He cannot either find himself any support in taking drugs anymore, as his trips become more and more terrifying; hence, he sinks deeper and deeper into alcoholism. His bold attitude toward life experiences, that made him a legend, shows up as a fake. By reading his novels, it could be thought he was describing his true life style, whilst the image he projected onto his books was totally different from the real man. 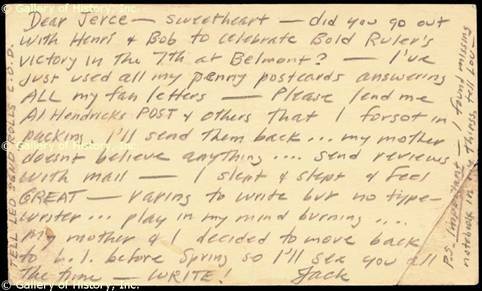 By taking a careful look at Kerouac handwriting, it is impossible to avoid recognizing the man as he actually was: an attentive observer, endowed with a powerful analytic intelligence, that “…out of necessity it falls into cut and cut in small pieces the matter it analyses, leaving it in pieces just because he does not possess any power to stick them together, to attract and join the parts together in order to build up a whole. ” (3) Such kind of episodic, fragmented and exterior narration, devoid of introspection and psychological depth, perfectly fit to the nameless teenage inner inquietude, is coincides perfectly with the aptitudes of the sign Disconnected. He found the cohesive power he lacked at a personality level in a range of intoxicating substances, capable of solving the detachment feeling that blocked him. But any personality lacking such cohesive power will be much more frequently caught inside addiction, as balancing a personal lack by using such powerful substances becomes an unequal game: actually, his analytical mind required a detailed observation of the world and-in doing so- somehow separated itself from the experience he was living; on the other hand, drug abuse allowed him to create an emotional connection with the world he needed so badly in order to draw from it the strongly longed-for Meaning.